My life with Greyhounds started many years back when my daughter, Angela, decided to adopt a precious Greyhound named Allie from the Mobile, AL track. When Angela married and moved to Dallas, Allie became our sweet charge. My husband fell in love with Allie's sweet temperament, and didn't want to lose both his daughter and his doggie companion to life in TX. Allie's innate shyness and our Dalmatian's, hyper nature fortunately balanced each other out well. After twelve-plus years, we had the heart-wrenching decision to euthanise Lady, our Dalmatian. Since late June, we all were coping with the fact that Lady was gone forever which seemed to be hard on Allie, too. In late summer, something exciting was happening in the Dallas area. 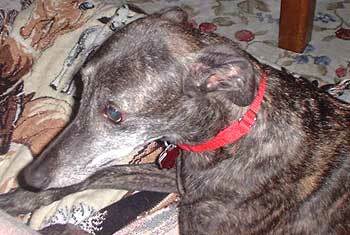 A stray, brindle Greyhound had been discovered living behind an apartment complex in South Irving. The kind manager was making every effort to feed her and contacted GALT to come get her. Angela, who is actively involved with GALT, was called to help capture the dog. She and her husband, Terry, would give us frequent updates on the little female Greyhound and how hard she was to catch. It took several weeks, but Princess was finally captured. Angela called me up on the way to the vets and told me how they used a humane trapdoor cage. My first words were, "Wow! It's a miracle!" Knowing all the effort put into capture this dog, "How amazing, they finally got her!" Princess was absolutely covered in ticks and had a few cuts from the brush she lived in, but was given a clean bill of health. Again, another miracle! She tested negative for heartworms and tick diseases, and had excellent teeth. Except for being very underweight, she was a healthy dog. Her greatest challenge, though, was trusting humans again. Her wounds were much more, shall I say, "emotional/mental/spiritual" than physical. In the meantime, Angela got the opportunity to foster Princess. She would often update us over the phone or send us photos via email of Princess's progress. She knew how my husband and I - and Greyhound Allie - were still missing Lady. I think from the start Angela felt like there could be a place in our hearts and our home for Princess. Angela got permission to drive here to Baton Rouge with Princess and introduce her to us and to Allie. It went really well, and Princess was thrilled to run in our big backyard with Allie. After the important interviews confirming that we were good candidates to love and care for her, Princess came into our lives. My husband and I both knew she would need a great deal of gentleness, love, and reassurance - soft voices, soothing touches. In fact, for the first ten days I kept a journal about everything that was happening with her because I wanted to mark the progress. It is slow progress but it is good. Princess has begun to run and play with Allie in the backyard, and even is wagging her tail some. They seem to be doing well together; I haven't even heard a growl from either of them. Princess eats all of her food and vitamins. She has never been picky from the get-go. Instead, she seems just so grateful. And a couple days ago, she licked my husband Rich's hand one single time on the back porch! He was so delighted at this sign of affection! Princess still feels safest in her huge crate, and as long as she wants it she'll have it. She takes at least one walk a day - and often two. Her eyes look at you like they can see right through your soul. They are the most beautiful eyes! She is still afraid of humans and will often step back as you approach. You can't throw a toy to her because she remembers people throwing stones. But the joy is that we are making SO much progress day by day. We are so blessed to have Princess. We thank GALT for this great opportunity to love and live with such a magnificent, sweet creature as Princess. She is truly a walking miracle!